Poverty Wash starts at the base of the White Cliffs, a few miles outside the eastern boundary of Zion National Park, and joins the East Fork of the Virgin River after 6 miles and a drop of 1,300 feet. 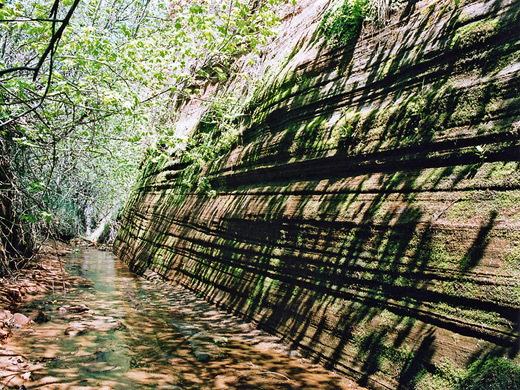 The cliffs prevent easy access from the north, and there are no roads anywhere close to the river in the south, so this is a very peaceful, completely unspoilt region despite being relatively close to highway UT 9 that runs just north of the White Cliffs. 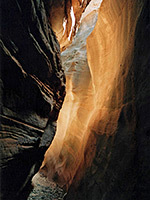 Poverty is a smaller version of Misery Canyon, 1.5 miles to the west - both start with a long upper section across open ground, form a canyon that has slot sections alternating between wider parts, drop down abruptly into a dark, enclosed lower section containing a permanent stream, and finally join the river in the middle of its own deep gorge (Parunuweap Canyon). 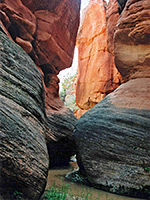 As Poverty is a little way upstream and higher in elevation than Misery, the narrows are generally shallower and shorter, though equally pretty, cutting through swirling, red and orange Navajo sandstone rocks. 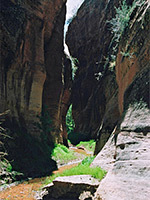 The wash is reached by the same track that leads to Mineral Gulch. There are two route options; one is to take the right fork of this track, a 4WD road that heads generally west, along the very top of the White Cliffs, then walk down one of several tributary ravines that merge a mile or two downstream to form the main Poverty Wash drainage. The walking distance to the Virgin River is about 7 miles but this is a rough, trailless route, not always easy and the round trip would be a long all day hike. The other option is to drive, cycle or even walk down the main fork of the track, as far as the vicinity of Mineral Gulch, then hike west across generally flat, easy terrain towards the lower end of Poverty Wash, the part with the best narrows; this is the hike described below. The track has a steep, rough spot 1.5 miles from the highway, from where it is about 10 miles to the Virgin River via Poverty Wash, initially along the track and then cross country. So if walking all the way this too would be a very long day hike, for a round trip, though still quite possible. A 4WD vehicle could reasonably be driven at least 2.5 miles further, and maybe for 3.5 miles, while a mountain bike can go 5 miles, until the route leaves the track, though a cycle has to be pushed on the return journey back up some steep and sandy sections. 17 views of Poverty Wash.
TopoQuest topographic map of Poverty Wash. The track heads south through flattish woodland, drops into a rocky creek and follows it a way, turns right, up a sandy slope to the edge of a big side canyon, then descends, winding around the head of the canyon down to more sandy land on the far side. The track, now just a sandy ATV trail, eventually turns west and back north but the shortest route to Poverty Wash is to leave the track once past of the end of a high ridge on the right, then walk in a (mostly) straight line, initially due west then veering to the north, reaching the Poverty drainage after 2.5 miles. A good map is necessary for this. The route is up the side of the valley towards a small plateau, the southerly continuation of the high ridge, down the other side and across a minor canyon then up a slope and on to the flat, tree-covered Poverty Plateau - no landmarks here to aid navigation, but the land eventually drops down, quite steeply to the next canyon, Poverty Wash; the entry point to aim for is just a little east of a place marked 5025 feet on the topographic map. Turning downstream, the creek enters a good but short slot, widens a little then has better, longer, deeper narrows, which open out again then for half a mile the wash stays enclosed but without any more proper slot sections, just shallow channels and occasional small drop offs. There are many climb out routes at either side though the cliffs remain sheer and vertical much of the way. Easy progress is stopped one mile before the Virgin River junction by a dryfall of about 40 feet, below which is a good, dark slot. The drop can be rappelled, or bypassed on the left side, either by scrambling down a straight, steep, sandy chute in a crack in the cliffs after several hundred feet or by traversing less steep slopes a bit further on. Directly beneath the drop off, water seeps from various places in the walls creating a small stream which then flows through a cool, dark, twisty slot for 400 feet or so, opening out into a pretty, narrow ravine with trees and bushes beside the creek and much wildlife - lizards, snakes, frogs and fish. The stream trickles over small waterfalls, cascades and pools, all very picturesque and tranquil. 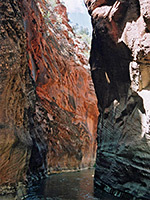 The water is clear, good for drinking, and the canyon walls are deep red in color, staying close together until the wash meets Parunuweap Canyon just west of a short enclosed section - part of the lengthy entrenched gorge known as The Barracks. 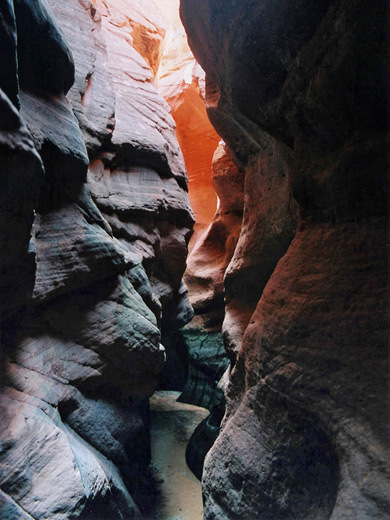 This region offers various options for continuation hikes up or down the Virgin river, such as along two straight side canyons that join from the south after a short walk upstream, both with clear streams running though narrow, overgrown channels and perhaps with slots beyond.